She sits on the ranch crossbar, her mouth open, her scream a sliver embedded in the hot afternoon air. She has been here all spring, and now with summer, she rides the afternoon thermals, rising up, rising up, until she is a spanned dot in a cumulus cloud. For years, my valley has been graced with owls, particularly the great grey, a totem bird, frequently delivering its message of change. Other years the great horned owls take over, raising their squawking young deep in the spruce forest. But this summer, it is the red-tailed hawk. She brings her own messages from the universe, along with courage and illumination. She sees the big picture, like the valley spanning below her wings and sharp eyes. Her vision is beyond the trivial. She is of the sky world, a higher plane of thinking and seeing. A lofty level of consciousness. Am I a hawk person? Do I hear the messages? Do I see things in a world view? 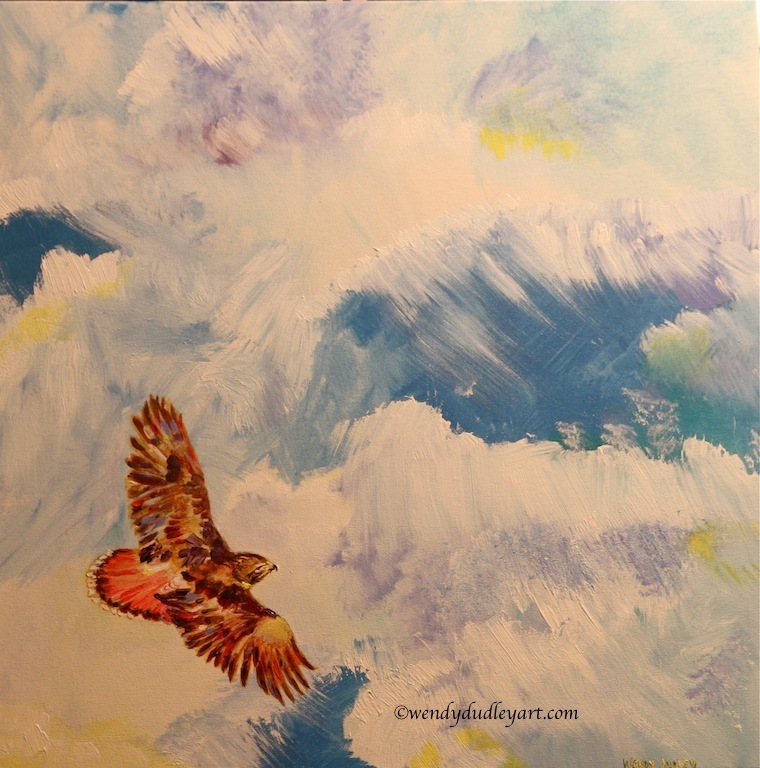 Spiritualists say the Red Tailed Hawk is a special companion, never leaving you, accompanying you throughout your own life flight. I wonder, as I watch her soar the skies: Does she hold me in her talons? This entry was posted in Musings on June 27, 2015 by Wendy. Smarty Jones. Big Brown. California Chrome. I put money down on all of them, with the hope I would have a souvenir ticket stub from a Triple Crown winner. It was not to be. And this year I was too busy to bet. Of course, as luck would have it, we came up with a champion, 37 years after Affirmed won the coveted prize in 1978. Watching the race was to witness beauty. A perfect ride. A clean and decisive wire-to-wire win with jockey Victor Espinoza. 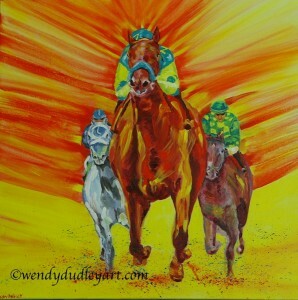 I knew right then I had to paint this horse, this bay thoroughbred colt with the faint star on his forehead. This personable horse named American Pharoah. He would be bold, strong and muscled with passion. He would be out front, with Frozen and Keen Ice coming from behind (they placed second and third, respectively). And he would be almost larger than life, so confident and so strong, there is no question that AP will be first to break the beams at the finish line. In a back story, this painting is also a nod to a grandfather I never met. He was a jockey, and in those days he would jog while wearing a huge plastic bag over his running gear; this would cause him to sweat profusely, keeping his weight down. 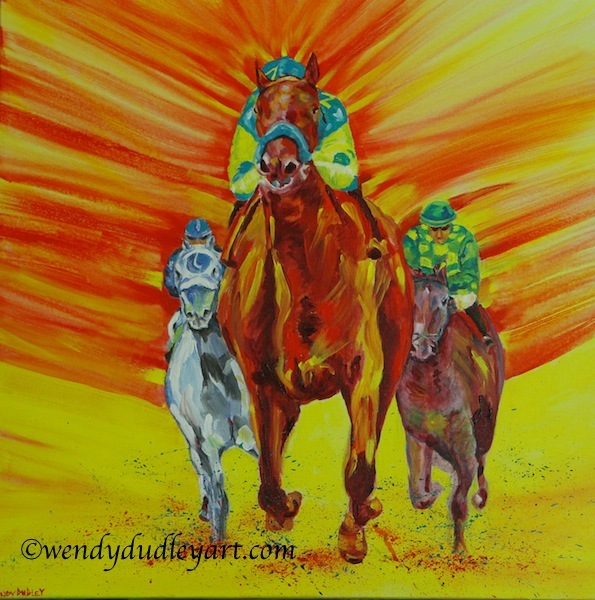 My mother has fond and vivid memories of spending afternoons at the track, while her father rode the horses. His name was Victor Jenkins. Another Victor. Horse racing has its own subculture, and in those days it was rife with alcoholism and womanizing and questionable tactics. I don’t know how my grandfather fit into this unique world, but I do know he spent a lot of time racing in Cuba. Of course, he has long since departed, and I have been told he is buried somewhere in Massachusetts. 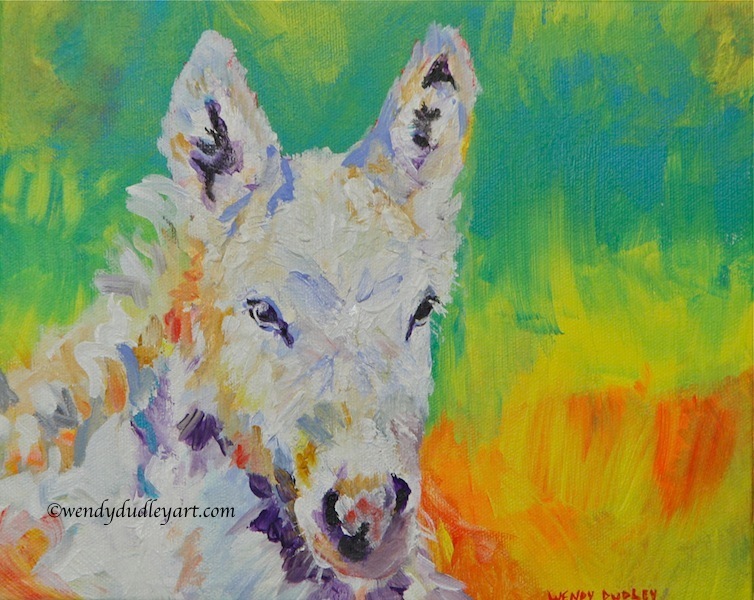 This entry was posted in Musings on June 23, 2015 by Wendy. I never had the joy of meeting Summer. 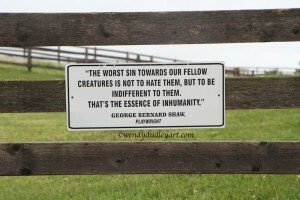 But her presence was everywhere during my recent visit to the Donkey Sanctuary of Canada. Volunteers and staff spoke of her in terms of endearment; she was the sanctuary greeter, its ambassador, its gentle jenny who made friends with children and grandparents. She met you at the gate, she trotted beside you, she nodded off while being groomed. For13 years, Summer delighted all those who had the fortune to meet her. She was a blue-grey donkey with striped legs and a dominant cross over her withers. And her bray meant business. She arrived at the sanctuary on a scorching summer day, thus her name. She had been abandoned. But with top care provided by the sanctuary, Summer thrived. She strolled in paradise, soaking up all the attention. Sadly, Summer recently passed away. She was 45 years old, the sanctuary’s oldest donkey. Staff blessed her with their last act of kindness, relieving her of a painful and sudden illness. There was a celebration of her life: smiles, tears and hugs. No longer would she meet visitors and staff at the gate, or in the lane. I could sense the loss when I was there. The sanctuary’s executive director, Katharin Harkins, put it perfectly: “Maybe somehow this splendid donkey made us all believe in magic a little, or so I like to think, and that good things last forever.” There are almost 80 donkeys, mules and hinnies at the sanctuary, some with sad pasts, and some who came from elderly or ill owners no longer able to care for them. 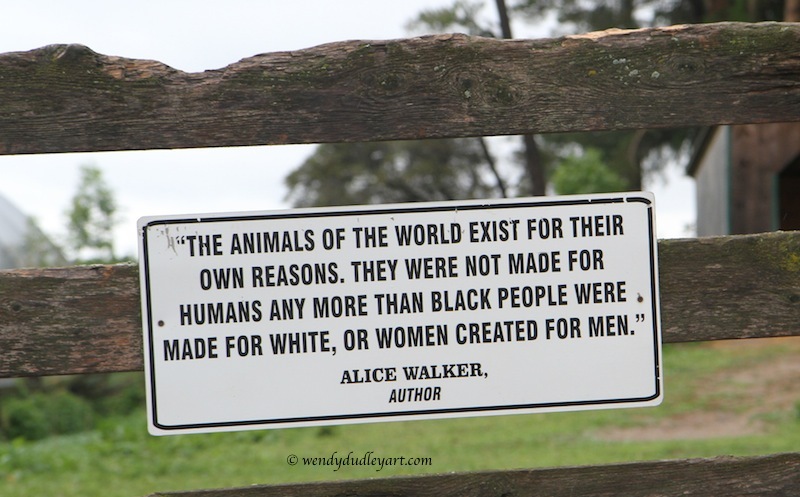 Each deserves a good life. Each deserves to be loved in the same way Summer was loved. She will never be forgotten; she will live on in the hearts of all who knew her, who sang to her, who brushed her, who simply respected her for her will to survive. For her heart. I dedicate this painting to Summer’s memory. I chose soft colours to reflect her gentle nature; and I set her against yellow and orange, to represent a hot Summer day. Do not remember her with sadness; let her memory bring you joy, the same joy she gave you. The painting extends around the edges, so requires no framing. If you would like a canvas print, also wrapped around on a wooden frame like this, let me know through my Contact page. Cost is $150. Bring a little Summer, and her joy, into your life. 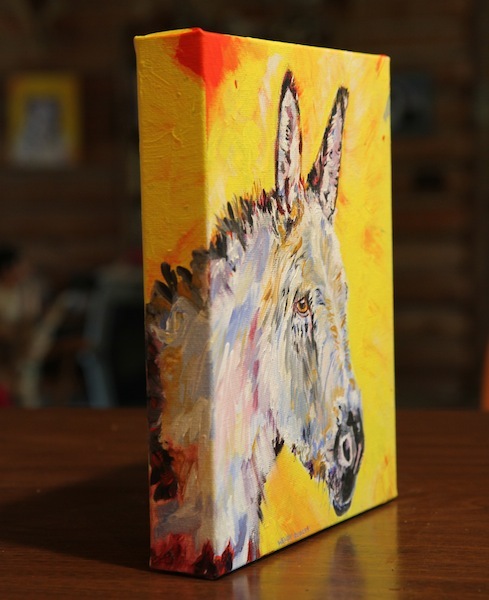 Ten per cent of all donkey painting proceeds go to The Donkey Sanctuary of Canada. 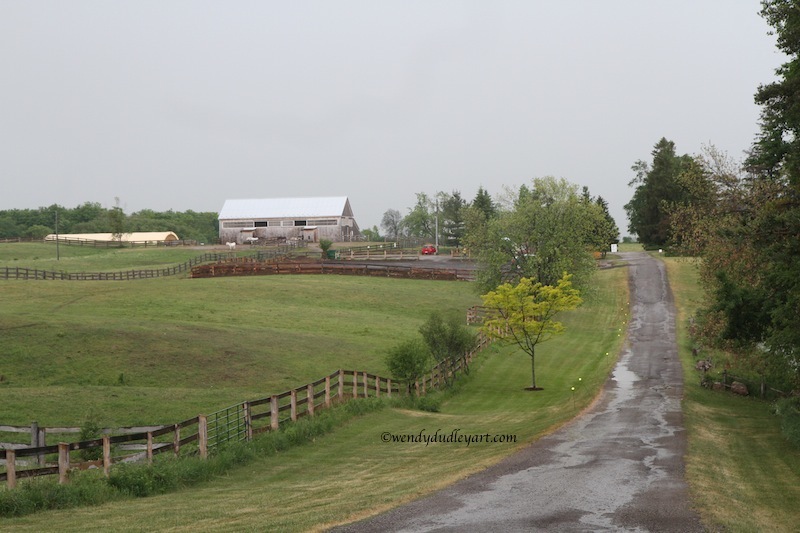 This entry was posted in Musings on June 14, 2015 by Wendy. When people come into contact with an animal, the two speak. Each tries to understand the other’s language. Sometimes the language is pure silence. Just being in the presence of one another. And then, the power of touch. Some times there is no need for words. Just a hug, a scratch, a body to lean against. 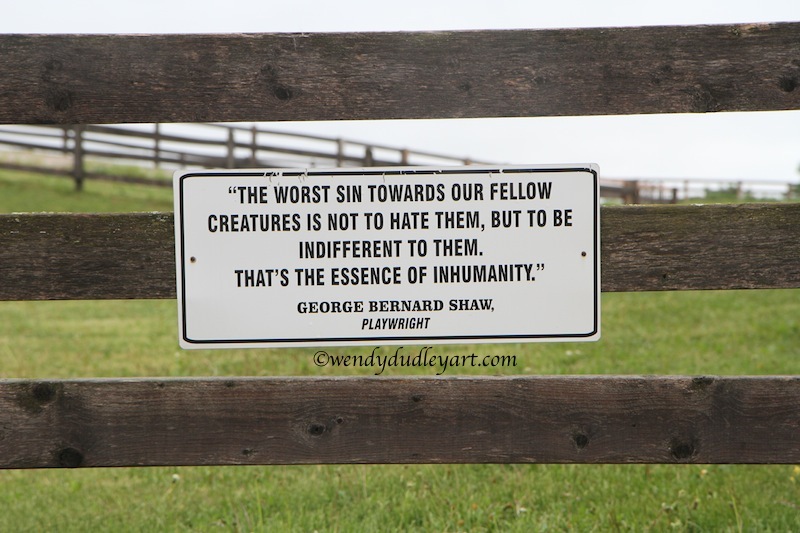 Throughout the grounds of The Donkey Sanctuary of Canada, there are signs posted with quotes, honouring respect for non-human beings. This entry was posted in Musings, Uncategorized on June 13, 2015 by Wendy. I don’t have a huge bucket list, as I prefer to be grateful for what I have rather than focus on what I don’t have or what I have not done. 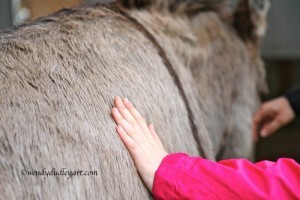 But I did have a wish this year to visit The Donkey Sanctuary of Canada, near Guelph, Ont. Modelled after the donkey sanctuaries in Britain, which were founded by the late and most wonderful Elisabeth Svendsen, who made it her life-long mission to improve the welfare of donkeys around the world, the Donkey Sanctuary of Canada takes in donkeys, mules and hinnies that have been abused, or have owners who are no longer able to care for them. I have donated to the charitable non-profit organization for years, and have an agreement that in the case of my demise, my longears will be sent there. 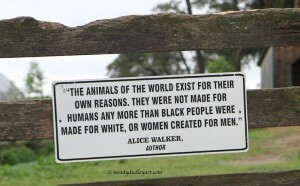 So for good reason, I wanted to visit the sanctuary and meet the key people responsible for the animals’ welfare. I was not disappointed, as facility upgrades and genuine concern for what is best for the donkeys was evident everywhere. The grounds were immaculate (no easy feat when there are approximately 75 donkeys living there), the staff and volunteers warm and sincere, and the animals were in good shape. Again, not easy since the donkey is a desert animal, and thus is best suited for a dry habitat. 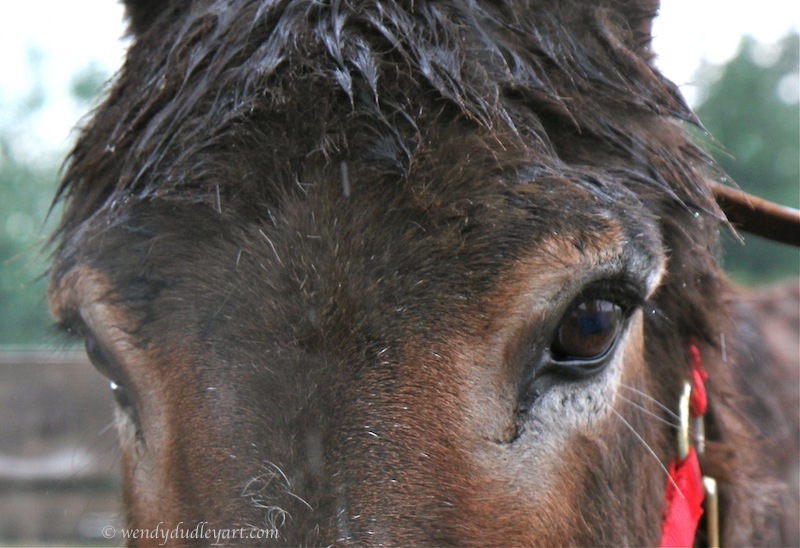 Wet hooves and damp skin leave it vulnerable to hoof abscesses and skin fungi. I deal with these challenges in relatively arid Alberta, so the spongy ground and humidity of southern Ontario keeps the donkeys’ farriers on their toes. There are quarantine areas, treatment centres, and divided areas separating the mules from the donkeys. More than 40 donkeys were munching on their hay in a dry barn, with no fuss. 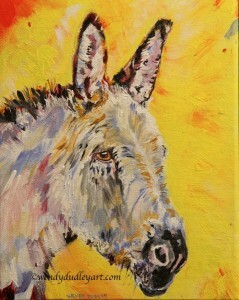 A slight flattening of the ears or a subtle swing of the head was enough to warn a donkey to give another more space. All was calm. The sanctuary relies on donations, and receives only one government grant, used to hire a summer student. What it has accomplished since it was founded in 1992 is simply amazing. To describe it as a deluxe resort for donkeys is not an exaggeration. 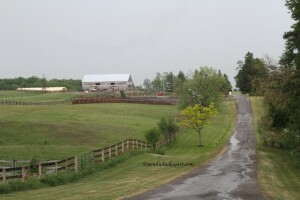 If you live near Guelph, or are simply passing through — the countryside is rolling farm fields, with lush umbrella elms, cedar rail fences and stone farm houses with bank barns — I encourage you to visit this wonderful retreat for one of the most soulful animals on the planet. Over the next while I will be painting scenes from my trips there, to be posted on this site under Recent Art and Equines. Enjoy! This entry was posted in Musings, Uncategorized on June 12, 2015 by Wendy.